Justin Upton is struggling. A rising star and one of this year’s trendy MVP picks, the 24-year-old right fielder was expected to have another amazing year for the Diamondbacks. 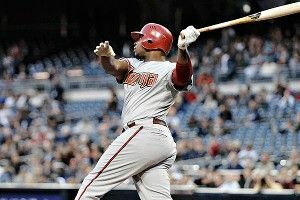 But a lingering thumb injury has hampered his swing and hurt his production — currently at .212 BA/.350 OBP/.273 SLG. Upton saw a hand specialist Tuesday, and while he might avoid a trip to the disabled list, the Diamondbacks are hinting that a few days off might be in order. Still, on a recent visit to Coors Field, Upton hit the batting cage three and a half hours before game time, getting his swings in with running mates Chris Young and Ryan Roberts like he does every day. After his cage work, Upton sat down to talk about his progression as a player, his approach at the plate, and learning defensive tricks from his talented outfield mates. did you hustle every pitcher in the league in charity golf tournaments? What happened? I don’t know. It was weird because I’d never been a guy to get hit in the past. I took my normal approach that I take every year. For some reason everybody wanted to pitch me up and in, and I got hit quite a bit. You weren’t standing any differently in the batter’s box? No, I don’t think so. I’ve kind of had the same spot since I came up. I’m not off the plate by any means, but I’m also not crowding it. Their plan was to plant me inside, and they were very accurate [laughs]. You’ve improved a lot as a hitter since you first came up. Are you someone who watches a ton of video and tweaks your swing a lot? Or are you pretty much “see ball, hit ball”? Last year, especially, I was more “see ball, hit ball.” I’m kind of a feel guy. I go in the cage and try to get a certain feel. I am a mechanics guy, I do work on my mechanics. But I can go in there and work on things for a long time, and I still might not get that feel. That’s what I’m really looking for. Last year, especially, you made some big strides. One of the biggest was you struck out far less often than you had in the past. Like you said, you don’t tend to make major adjustments. So was it just getting used to the pitchers? Maturity and experience? I do think it’s maturing as a hitter, being a little more patient. I think I’ve improved in that aspect, making sure I get a pitch to hit. What do you think is the biggest weakness still in your game? I would say defensively, I’ve been playing the outfield for six years now, so I’m still working on it. And you’re out there next to Chris Young and when he’s out there, [Gerardo] Parra, both really good defenders. What do you think you can learn from them? Parra’s got a great arm; he really knows how to use his arm well in games. Me and him messed around in spring training, trying to work on a couple of things with my throwing. Chris is just a great guy to watch. He gets great jumps in the outfield, does a great job of playing angles and getting to the ball. We all work closely together in spring training. I’m always trying to pick up little things from them. You were the no. 1 overall pick; you were always supposed to be the guy. How do you deal with that mentally, all the expectations? Over time you get used to it. Early on in my career I didn’t think it would bother me, but it did a little bit. It definitely weighed on me a little. But now I go out and enjoy playing the game every day. You guys had a great run to the playoffs last year. What was the atmosphere like, both in town and in the clubhouse? We had a really fun clubhouse. We still do. We jelled well as a team. We spend a lot of time together, and everybody’s got a certain relationship with each other. It’s a great atmosphere to be a part of. We joke around and have a lot of fun. Around town in Phoenix the fans really got behind us, this year too. It’s always fun when you’re getting that kind of support every night. Growing up as an Upton, having that sibling rivalry, and then in the area you grew up [in], you had guys like David Wright and Ryan Zimmerman playing, this was a hotbed of baseball. What’s it like to have that all around you, in your family and in the community, elite players everywhere you look? I was younger, and it gave me something to strive for. Watching those guys mature as ballplayers, I got to see what they had to do to get to that level. It made my job a little easier — I just went out and did the same things they did, prepared the same way, worked hard. It was a little easier for me because I’d seen those guys come up. When I got to the big leagues, Chris [Young] became my best friend and he’s been my best friend ever since. So we went out and celebrated a little bit. But that was kind of the end of it. It’s a cool point in your life where you know you’re set for life. But it didn’t change me too much. If you enjoy the game of baseball, you’re going to play the game the same way. Still have the same fire, still get mad when you make an out. It doesn’t change you very much. More than anything, it was exciting to know I was going to be here for the next six years. That I was going to be able to grow with my teammates, like Stephen [Drew], CY, Miguel [Montero]. And we’ve added some other guys, some big pieces who’ve helped us tremendously. [Kirk Gibson] being your manager, when you lose a couple in a row, does he flip on video of the ’88 World Series and say, “There, that’s how it’s done”? No, I mean the thing is, he knows what to expect from ballplayers, he knows how tough the game is. If we’re going through a bad streak he’ll tell us to pick it up. But it’s a part of the game and he understands that. You have a pretty relaxed clubhouse, then? Oh yeah, he knows we’ll police ourselves. If things aren’t going the right way, someone will step up and say something. That’s the way it should be. If you have that kind of passion in the clubhouse and a bunch of guys going all in, it’s easy to right the ship.